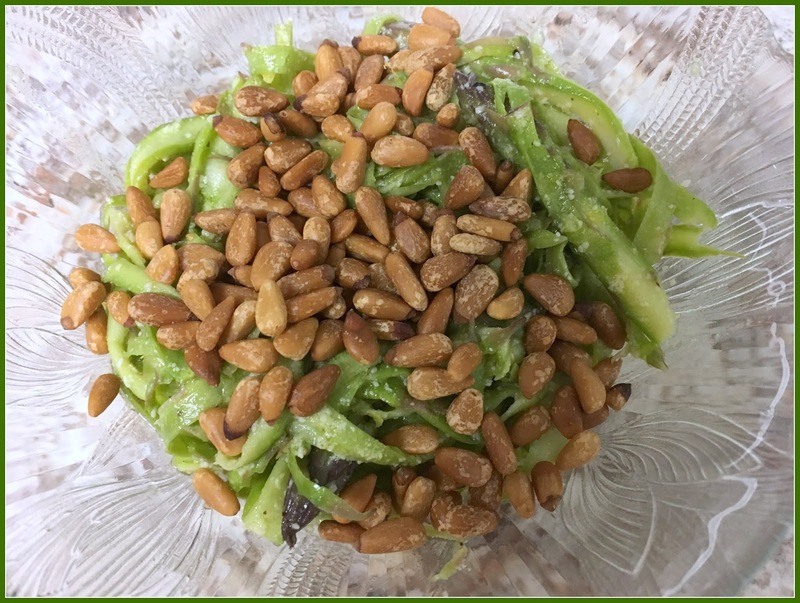 It's been awhile since a new recipe has been posted. We're cooking at home most evenings, but I usually don't have the forethought to take photos while doing meal preparation. Last week I did take photos of one of our dinners, but only the plated results, not the prep steps as my hands were too food-involved. This main and side dish pairing was very good and enjoyed with a glass of Pinot Grigio white wine. It's a fairly simple recipe, but being a first-time menu, it took a bit longer than anticipated, but definitely worth it. I paired this main dish with a side dish of shaved asparagus salad, which was also a first time prep. I'm planning a "redo" with a different seafood, shrimp next time. Place scallops on paper-lined plate and dry with additional paper towels. Bring 1 cup of water to a boil, add peas and 1/2 tsp salt. Cook until bright green and tender (2 min. for fresh peas and 4 min for frozen). Drain peas and reserve cooking water. Add bacon to large skillet and heat over medium heat. Cook bacon, stirring occasionally, until fat renders (about 3 min). Add shallot and cool until softened and bacon is crisp (3 min longer). Transfer bacon and shallots to bowl using slotted spoon, Reserve bacon fat. Add 1/2 C cooked peans to bacon-shallot mix. Puree remaining 1/2 cup of peas, lemon juice, 1/2 tsp salt, 1/8 tsp pepper and reserved cooking liquid in blender. Add oil and puree until smooth. Heat skillet with reserved fat until barely smoking. Sear scallops till golden brown crust forms and scallops release from skillet (about 3 min each side). 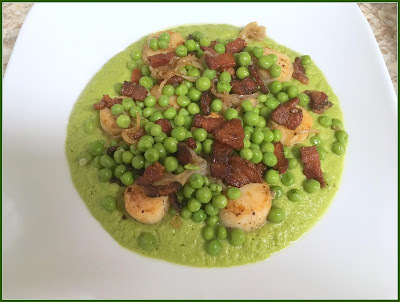 Place pea puree in center of plate and top with scallops. Then, top all with pea and bacon-shallot mix. Using a vegetable peeler, shave asparagus into thin shavings. Tips will snap off and you can add to bowl. Roast pine nuts at 350 degrees until browned, about 5-8 minutes. Combine grated Parmesan cheese with lemon juice in small bowl and slowly whisk in oil until well blended. Season vinaigrette with salt and pepper. Drizzle vinaigrette over asparagus, toss to coat. Sprinkle nuts on top and serve. 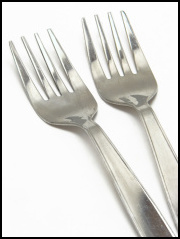 We really enjoyed this meal and Grenville rated these recipes two forks up. Enjoy ! Looks good! I think I'd like it better with shrimp too! I shudder to think how much time was involved in these beautiful to see dishes... I am the cooking hater and would never even try dishes like this.. Being a huge fan of scallops, that dish really caught my attention! The other one looked good too but if I only could try one, it would be the scallop and peas one. such a pretty dish, very fancy! I don't like scallops but the idea of shrimp sounded good. The asparagus salad looks yummy. These are wonderful dishes. I do like all the ingredients and would love to sit down to a meal like this. Both wonderful recipes, the scallops look delicious. I have never tried scallops. How sad is that? Your dishes do look inviting, though. Away We Go . . .